We invite you to celebrate Pilgrim's Bounty with us. It's a time for reflecting on your journeys and good fortune and sharing plentiful food and stories with friends. You can partake in wonderful Pilgrim's Bounty feasts near major towns by sitting at a Bountiful Table and enjoying the foods you find there. November 24 – December 1st. All capital cities and most Horde and Alliance towns. 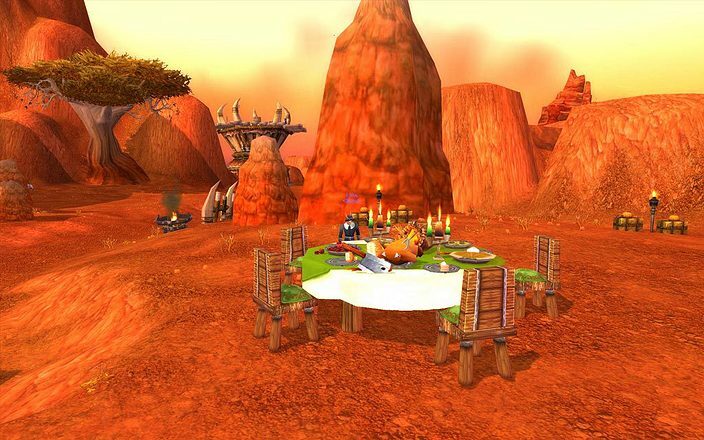 Even during hard times, the Pilgrim’s Bounty celebration emerges across the lands of Azeroth, bringing with it the opportunity to reflect and give thanks for the nourishment the land has provided. This season is the perfect occasion to brush up on your cooking skills while sharing in a veritable cornucopia of delicious offerings found on the communal dining tables located outside capital cities. There’s also no better time to go on a wild turkey hunt, or, should wild turkeys prove too elusive, transform friend and foe into tasty turkey targets. Bountiful Tables are loaded with food and surrounded by interactive chairs that allow you to eat and share food with other players via the action bar. If you eat five helpings of any single food, you'll gain benefits unique to that food. In addition, if you eat five helpings of every food, you'll gain the Spirit of Sharing buff, which lasts one hour and increases reputation gained by 10%. Outfits and delicious dishes are on the menu for this event, as well as a yummy pet for your collection. This other poultry companion is taught by a Frightened Bush Chicken, and can be found in a Pilgrim's Bounty reward bag. You can receive a sober hat as a daily quest reward, or find a transmogrifiable Fine Pilgrim's Hat in a Pilgrim's Bounty reward bag. Pilgrim’s Attire, Pilgrim’s Dress, and Pilgrim’s Robe are available as daily quest rewards. Boots, available as a daily quest reward, are the final addition to your Pilgrim regalia. These items will turn another player into a delicious and innocent turkey: available as a permanent toy and as an event quest item. 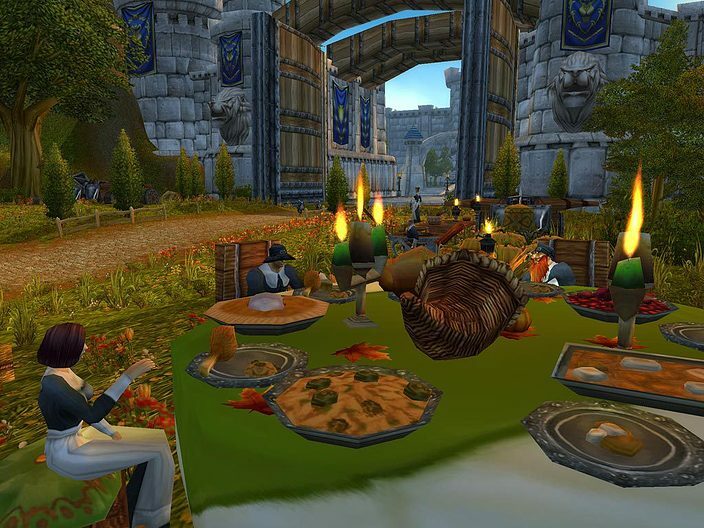 Many different dishes and meals are available during Pilgrim’s Bounty, whether you’re sitting on a Bountiful table or cooking delicious meals yourself: Pumpkin Pies, Spice Bread Stuffing, Cranberry Chutney, Candied Sweet Potatoes, and Slow-Roasted Turkeys, Teldrassil or Mulgore Sweet Potatoes, Tangy Southfury or Tangy Wetland Cranberries, Ripe Elwynn or Ripe Tirisfal Pumpkins... and, of course, Bountiful Feasts. Pilgrim's Bounty currently offers a total of 100 achievement points, split over 9 achievements and 1 meta-achievement. If you complete the 9 Pilgrim's Bounty achievements below, your character will gain the title of the Pilgrim. Visit our Pilgrim’s Bounty gallery for some images from the annual event!